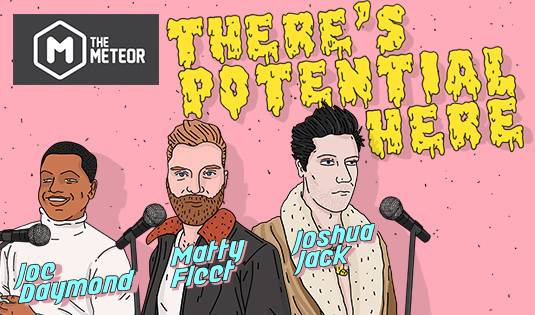 Three young comedians take the stage performing 20 minutes each live at the Meteor Theatre. Joe Daymond, Matthew Fleet and Joshua Jack bring you a unique mix of comedic styles. Whether you’re into deadpan, improv or just traditional joke slinging, you’re bound to enjoy something in this line-up of some of the brightest talent coming out of the Long White Cloud. With all three comedians still within their first two years of comedy, and having already amassed an array of awards, television appearances and big time gigs, they’ve been touted as ones to watch for in the future. Also, that was a complete lie; none of us have been on TV, nor won awards, but we did have some pretty big gigs. Matty was in a very limited-time-only beer advertisement on Facebook. Joe did his cousin’s 21st which was his entire Islander family and Josh gigged in Australia and there’s heaps of people here. So don’t miss the chance to see them in an intimate venue while you can, because while you may not know them yet, There’s Potential Here.